The sense of relief that much of the industry felt when President Donald Trump signed the Bipartisan Budget Act of 2018 into law was short-lived. The law, which ended a five-hour government shutdown, set aside billions of dollars for a number of healthcare programs. While funding for community health centers and other programs are set based on the BBA, Congress must pass agency appropriations for the current fiscal year by March 23 to stave off another shutdown. 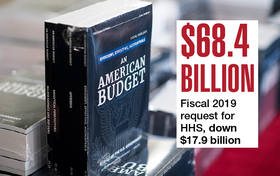 Trump last week unveiled his fiscal 2019 budget, which included a 21% decrease compared with HHS' approved 2017 funding. How lawmakers weigh the president's spending blueprint is an open question. Beyond big-ticket items, like proposed cuts to public health, Medicare and Medicaid, the budget also trims comparatively smaller programs across the healthcare landscape. Download the PDF.